This large wall piece is a reworking of early Plywood Pieces in which a given sheet of plywood, in this case, a scaled 4’ x 10’ sheet of cherry plywood encased in epoxy, was cut in a 3:4 progression and reassembled. The tape fortifies the surface, keeps the parts in line, and forms a random patterned “see through” mesh. I was reminded of bandaging hospital patients as an orderly in the late 1960’s. 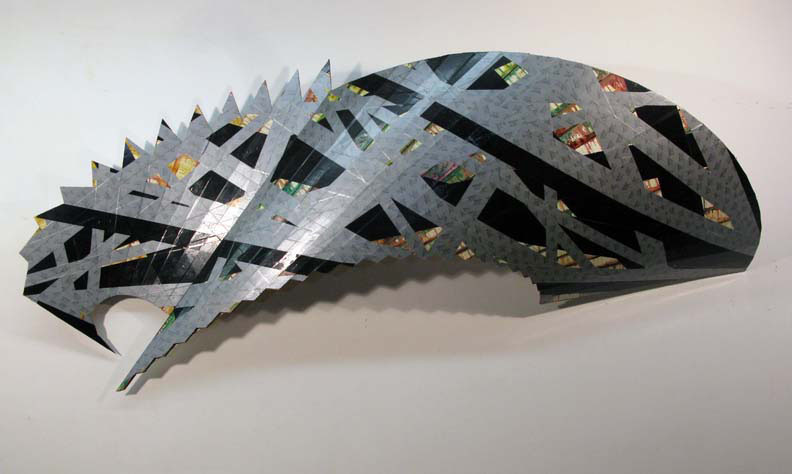 The sculptural issues are mostly hidden--fusing the parts, fixing the shape, supporting the flexible surface, and getting the piece to hang on the wall. H: 5 ft. x W: 10 ft. 3 in. x D: 22 in.